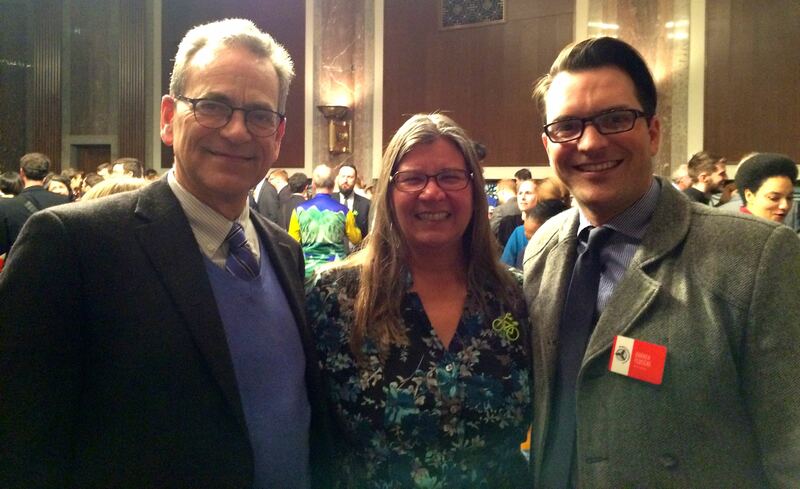 13 Floridians Attend The National Bike Summit in Washington, D.C. Team Florida – which was made up of 13 Floridians – worked from the “top down and bottom up” to advocate bicycling. 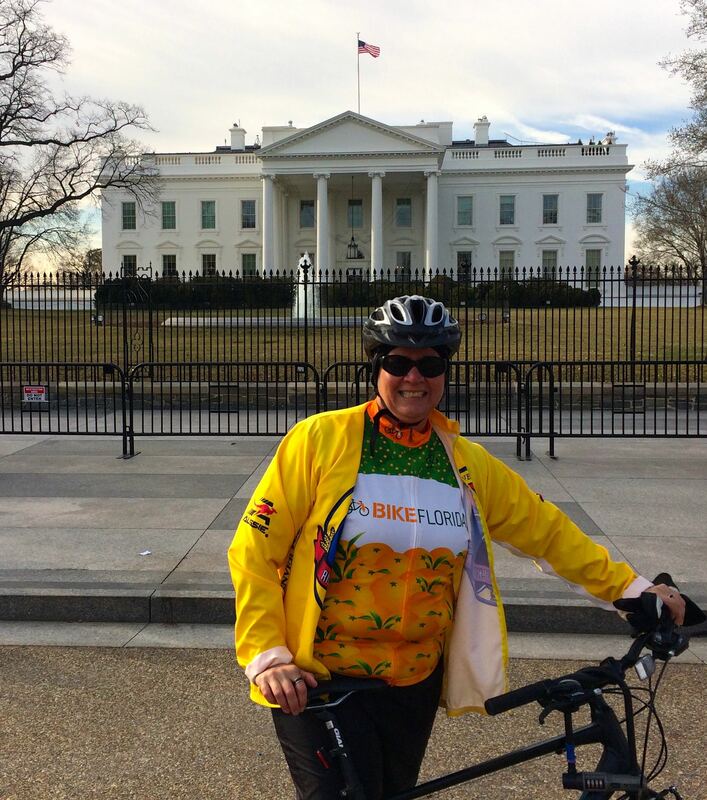 Bike/Walk Central Florida’s own Lisa Portelli and Amanda Day were among Team Florida – who represented the state at this year’s League of American Bicyclists’ National Bike Summit in Washington D.C. last month. Thanks to Becky Afonso from the Florida Bicycle Association and the cycling enthusiasts who worked from the top – lobbying the state’s representatives and senators – and need help from the bottom – you – for your support of bicycling. You have to start somewhere and everyone has their opinion as to if advocacy starts at the top (to trickle down) or at the bottom (to build up). In my own personal experience, I have seen how progress will paralyze itself while good, well-intended people try to figure out (and even argue) where to start. Upon returning from Washington, D.C., and attending the National Bike Summit, I can say with certainty, you have to start somewhere, and the answer is YES. By definition, advocacy means to support a cause or policy, that’s advocacy. Advocates are people, people representing people to people that make decisions. Allow me to share my summit story of advocacy and people. A total of 13 advocates from Florida attended the League of American Bicyclist’s National Bike Summit to represent YOU, the people, at the federal government level. These 13 represented local, state, national and international entities with bicycling as the common interest, calling ourselves Team Florida. 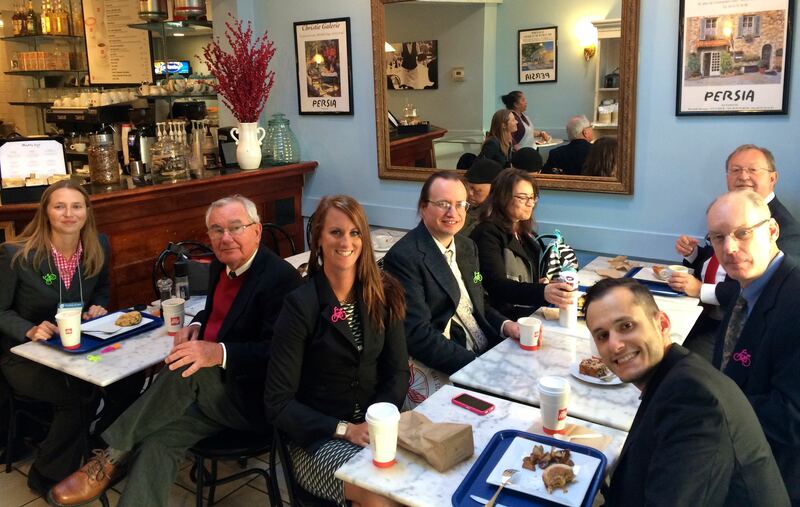 ..and starts lobby day with a good breakfast and new friend from South Dakota. To those of Team Florida who could not lobby, we appreciate your time and efforts to attend the summit and be a part of the team: Lisa Portelli of Winter Park Health Foundation, Amanda Day of Bike/Walk Central Florida and Christine Acosta of Pedal Power Promoters. Here’s the shout out to the rest of Team Florida: Michael Armadoros of J&B Importers, Jason Aufdenberg, professor at Embry-Riddle Aeronautical University Daytona Beach, Joy Hancock of Bike Florida, Sue Kawalerski of Miami-Dade Bike 305, Gary Mendenhall of J&B Importers, Lacey Nickell of Ride of Silence, Jim Shirk of Hillsborough County Bicycle and Pedestrian Advisory Committee (chair), Brian Smith of the Florida Greenways and Trails Foundation and Joe Webb of Miami-Dade County Parks. From the “top”, our advocacy ask to all 27 Florida U.S. House of Representatives and two U.S. State Senators was simple and three-fold: 1) Continue to support transportation funding for bicycling and walking (extension of MAP-21 and/or new legislation); 2) Support and co-sponsor the Vision Zero Act; and 3) Become a member of the Bike Caucus if not so already. Speaking of the Bike Caucus, Kudos to House Rep. Vern Buchanan of District 16 for becoming the co-chair of the caucus and to Reps Gus Bilirakis (District 12), Kathy Castor (District 14), Mario Diaz-Balart (District 25) and Debbie Wasserman Schultz (District 23) for being members. If these are your U.S. House Representatives, call or email their office TODAY and thank them for their interest and support of bicycling! They need to hear it from the base (“bottom”), and the base is YOU, the people. On ‘Lobby Day’, the ‘Team Florida 10′ spent the day on Capitol Hill, meeting with the staff of 21 House Reps and two Senators. For most, this meant attending 9 meetings with all but one outside of their voting district. We paired up or went in groups of three or four, and for the Senate meetings, we nearly brought the whole team! We met with the staff of every House Rep who sits on the Transportation and Infrastructure committee. And for those House Reps where we couldn’t schedule a meeting, information and materials were dropped off at the office. It was a busy, busy day for 10 people to represent the Florida cycling community (YOU), but guess what? We did it! Mission accomplished! Go Team Florida!! 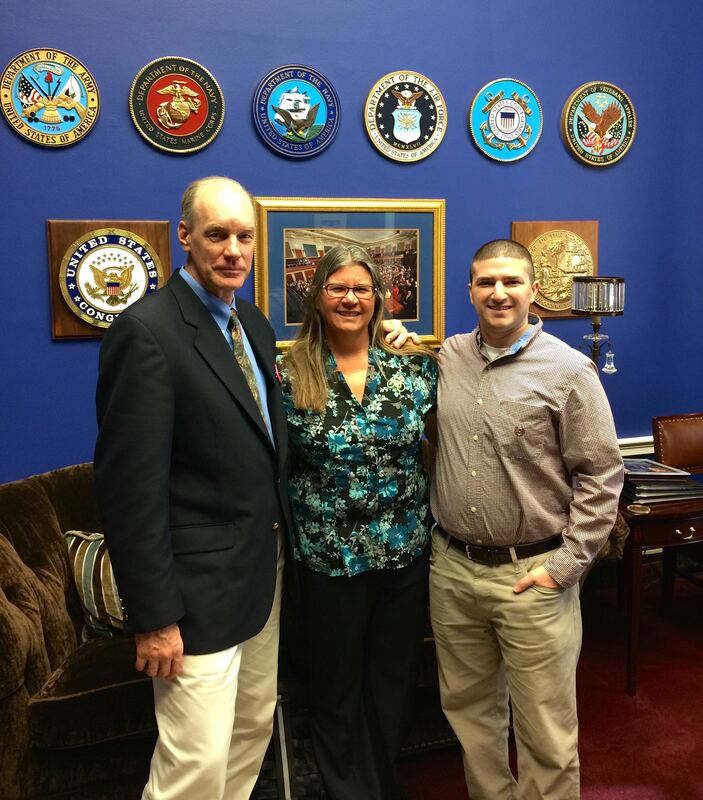 Gary Mendenhall, myself, and Hobart Richey of Rep. Vern Buchanan’s office staff. Thank you Representative Buchanan for being co-chair of the Bike Caucus and co-sponsor of the Vision Zero Act! Keith Laughlin, Rails-to-Trails Conservancy, myself and Darren Flusche, League of American Bicyclists. 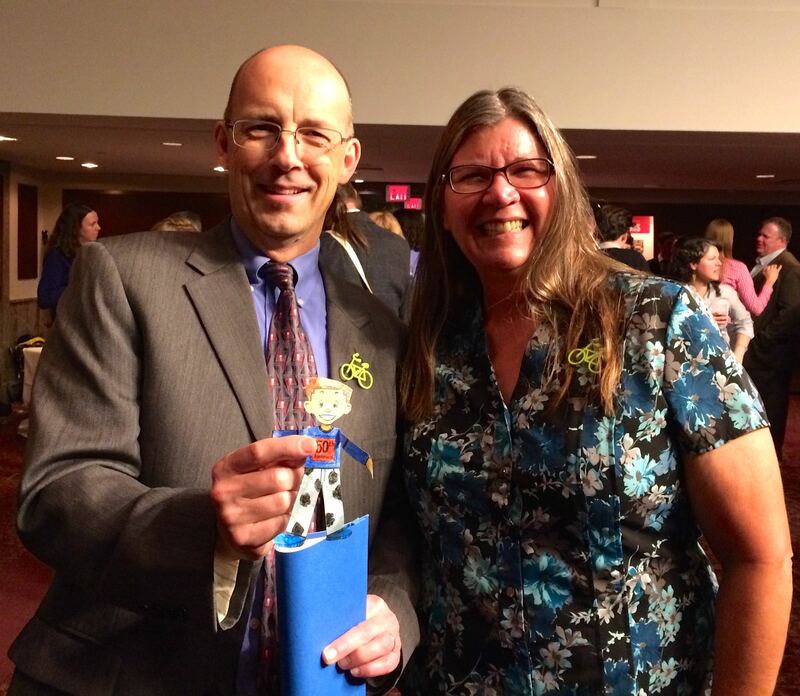 Andy Clarke, League of American Bicyclists president, holds up honorary Team Florida member Flat Stanley. I realize advocacy is not for everyone, I admitted as much to Team Florida during the summit. But advocacy has a place when the needs of people are not being met, or in the case of Florida traffic fatality rates, when very lives are being lost. It’s about people, the people who become advocates, the people that advocates represent and the people who make decisions. Everyone has a role and no one is alone. We are all in this together and need to work together for good to happen. March 18 is Pause for People Day! Alert Today Alive Tomorrow and Florida Bicycle Association encourage everyone to spend the third Wednesday of March as a day of remembrance for loved ones lost in traffic fatalities and also as a day to honor people who are pedestrians, cyclists, and motorists on our roadways today. For the inaugural year, Alert Today Alive Tomorrow will be collecting photos, thoughts and other expressions through social media. Wherever you are and wherever you go, Pause for People in crosswalks, give 3 feet or more for cyclists when passing, and yield the right-of-way, always. Every life counts – Share the Road today, on March 18, and every day. Visit www.FaceBook.com/AlertTodayFlorida or www.Twitter.com/AlertTodayFL to share your submissions for Pause for People Day. People – that’s YOU! You don’t have to be an advocate to share your story. Please share as many stories as you wish. Advocates like myself need to keep building the base (YOU) to show those people who make decisions at the local, state or federal level, that bicycling matters, that lives matter, and that PEOPLE matter – from the bottom to the top, back to the bottom. If you can’t be an advocate yourself, then support FBA by becoming a member today. The answer is YES, you can make a difference! Florida girl and bicycle in front of the White House! Check out the article on the FBA website.